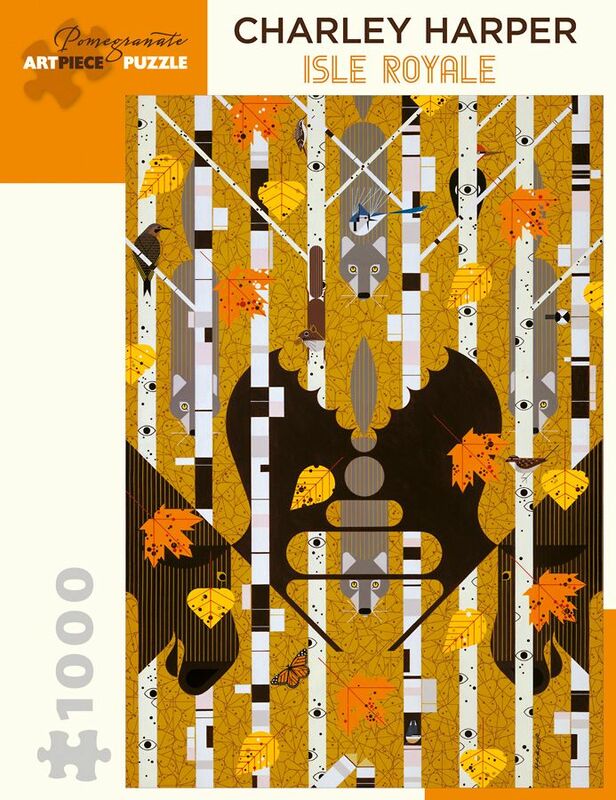 Before Charley Harper (American, 1922–2007) had painted animals of all kinds, from all continents, he was exploring the foothills near his family’s farm in rural West Virginia. A lifelong conservationist, Harper ultimately found his passion in creating fresh and witty paintings of wildlife in his own minimal realist style. He went on to delight legions of art and animal lovers the world over with his posters for the National Park Service, including Isle Royale National Park, Michigan. The park, established in 1940, spans a large wilderness island and more than 450 smaller islands in Lake Superior. It’s home to wolves, moose, and a wide variety of birds, a few of which Harper has perched amid the birches in this poster. The artworks for his park posters—massive, requiring a year each to paint—showcase Harper’s skill in depicting entire ecosystems by using simple shapes and patterns, and vivid colors. Thoughtfully conceived and engagingly intricate, the 1000 piece jigsaw puzzles combine superb color reproduction, stunning and unusual images, and sturdy construction to delight generations of novice and veteran puzzleworkers. Sign up to our newsletter for all the latest puzzle news and offers. From children's to adults there is something for everyone with a huge range of jigsaws to choose from. Copyright Yorkshire Jigsaw All rights reserved.